My Flatbush Life: JV College Bowl Team Competes at the Final Championships! 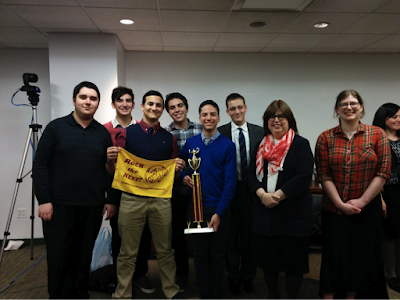 JV College Bowl Team Competes at the Final Championships! 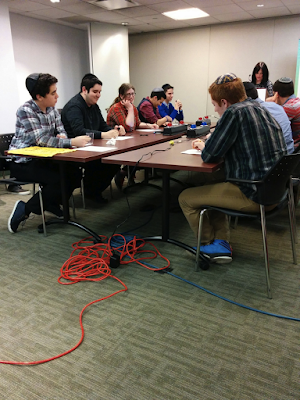 After competing in this season’s series of College Bowl matches, and winning the title of Division Champs in the Yeshivah League, the Yeshivah of Flatbush Joel Braverman High School JV College Bowl team went on to play in the semifinals and final Championship games on Wednesday, April 13. The intrepid JV team, David Azrak, Jacques Mosseri, Jonathan Kraidman, Josef Kusayev, Danielle Duchan, Moses Bakst and Robert Adler, played against the Central team in the semifinals, and after fielding fast paced challenging questions from all academic areas including politics, math, English, social studies, science and more, triumphed in a resounding win and advanced to the finals round. Cheered on by their Coach, Ms. Rachail Kurtz, family and friends, after a valiant battle of wits and scholarship which was streamed live for the benefit of all fans and supporters, the YOFHS team won a trophy and a second place finish in this year’s final Championships. Congratulations to the team for an exciting game and a satisfying year of College Bowl competitions.